The idea of profit-driven, scandal-ridden companies like G4S and Serco looking after the most vulnerable children in society is terrifying. There were fears that the government's plans to reduce legal duties for councils to protect children and young people could open the door to these companies. But we have good news! Reports suggest the government could be backing down on its controversial plans - and our new polling shows there is no public mandate for them. The polling, carried out by Survation, shows that only 17% trust the government's claim that removing key legal duties for councils won't lead to privatisation of children's services. Only 3% have ‘a lot’ of trust in the government’s claim. The Children and Social Work Bill, which will probably be debated next week, had been expected to enable councils to opt out of duties towards vulnerable children and young people who need protection. Only 1 in 4 think it is appropriate for private companies to run child protection and welfare services. A majority thought involving private companies was not appropriate - 52% overall and 50% amongst Conservative voters. Opposition to the idea was particularly strong amongst people aged 55 and older, 64% of whom thought it was inappropriate for private companies to run these services. The polling question explained that the government's previous position that the Bill would encourage innovation and give councils more freedom, with opt outs lasting for up to six years. 23% said they didn't know whether private companies should be involved. More than 50 organisations and leading experts including England’s former two Children’s Commissioners joined forces to oppose the Government’s plans, saying they would be dangerous for children. Private companies are already delivering foster care and children's homes. Removing vital duties could make it easier for firms like G4S and Serco to be handed child protection and other council social work functions. Our previous polling shows that these corporations are highly unpopular in the eyes of the public. If the government has indeed done a U-turn on its plans, that's excellent news. 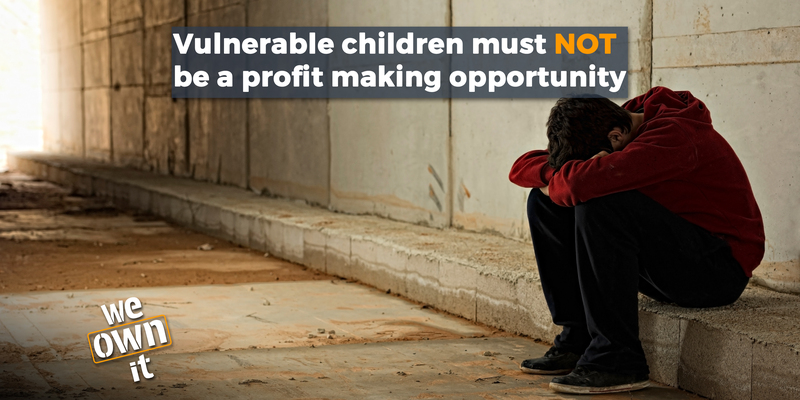 Children and young people who are at risk and rely on the state for protection must not be a cash-making opportunity.